On this page activists share their experiences on the picket line. If you would like to share your picket diary then please contact us. The idea is that others will be encouraged in to action by reading these diaries. represent those of Innovative Minds. By now I think its safe to call myself a professional picketer, if such a title exists. I accidentally stumbled across the secret phrase that made more people interested in what we had to say. That was not to mention Israel, but to simply state the truth: Boycott M&S, they support human rights abuse. This phrase has been the most effective at igniting the publics attention. This week we had another handful of strange cases. Firstly there was the woman who callously told me to go back to my own country (to which I replied promptly this is my country! ), to those who accused us of trying to take over the world. I also noticed that more people were willing to come and discuss the issue of boycotting with us, such one man who was interested in our aims and asked for information about other companies to boycott, to which I was gland to help. To all those who want to picket, it really isnt that hard, its approximately 2 hours of your time, all you have to do is turn up at the location. One thing that keeps me going is the people that you meet, the things they say, and learning to answer in a constructive manner. You dont need to shout or come dressed in a Palestinian flag, just look at it as a way of educating people who know nothing but what the media tells them. Once they know the truth all we can hope for is that they have a conscious and do the right thing. 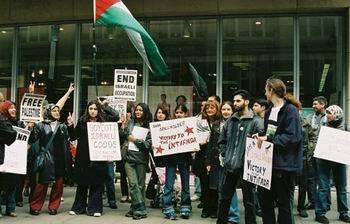 An Egyptian lady said to me, during last weeks picket, that she was afraid for us picketers, she was afraid of what M&S or the Zionist might do. I think what she really meant was that we werent aware of the power the Zionists have. On the contrary, I think we all know how much power they have; they have as much power as we choose to give them. The plague of powerlessness that has gripped the Muslim ummah, has plunged people into a state of complacency and appeasement that goes against all our Islamic beliefs. Its time for all of us to pull ourselves out of that state. This weeks picket had the usual low number of people turning up, but this time at least three brothers came, and towards the end of the picket we were also joint by two sisters and brothers. Armed with a loudspeaker, one of the sisters, who had a natural gift of public speaking made such a heart warming appeal to the public, asking them not to shop at M&S and telling them why. This courageous sister was verbally attacked by Zionist passers-by; one lady was so ferocious that her voice nearly drowned out the noise of the loudspeaker. Why is it that these Zionists can so wholly and confidently argue for their terrible cause, while we Muslims who have truth on our side, who know what justice is, are so afraid to speak out? Why is it that we are passive when God tells that He is always with those who act for His sake? It is our duty to make use of the freedom we have now to help our Ummah achieve its freedom, and doing little is far better than doing nothing. In comparison to the dismal turnout at previous Selfridges pickets, this picket outside M&S has a surprisingly high attendance (alhamdullilah) with 12 brothers and sisters (and may I add, as usual, more sisters than brothers). An hour into the picket a leaflet shortage crisis occurred and so we had to photocopy a whole lot more. Even with the poor quality of the photocopies we still managed to hand out all of those too, so it was a very successful day in terms of distribution, and successful because of the encouragement we received from the majority of the public (maybe this is not so surprising since this was Edgware Rd). Having said this we did get a few not nice comments such as one man telling us to stop killing innocent people and others who gave back the leaflets. Anyone who pickets know the great feeling you get afterwards when you feel that you really did something to help your fellow muslims. I know people are generally apprehensive about picketing and I used to be like this too, but honestly the reward you get out of it far outweighs any of the reasons you may have not to want to do it. The next London picket will be next Saturday the 13th of July, outside Edgware Rd, 12-2.00pm. Inshallah well see more of you Londoners there. We made our way to M&S with some apprehension, thinking that it was just going to be three girls with hardly any experience of picketing, and from earlier MPAC picket accounts we expected to encounter a mob of Zionists. Instead to our delight, as we made our way down Oxford St we began to see members of the public with bright yellow leaflets and we managed to spy out the words "Zionist", "boycott", "Palestine" on them. As we got closer to the store we heard someone shouting through loudspeakers, and to our surprise there was a picket already taking place with a stall, banners and people distributing leaflets and collecting petition signatures. With new confidence we began to distribute our material and after an hour we decided to move down to the Edgware Rd M&S store as activity there was non-existent. Knowing full well that our aim was to especially target the Muslim shopper, Edgware Road was really the best location for it. In Edgware Rd we distributed all of our material in less than an hour and met with some very interesting if somewhat incoherent members of the public. We received lots of encouragement from the predominantly Arab public in Edgware Rd. An Algerian Man advised us to target the Saudis with our campaign; we had no idea they shopped at M&S more than any other nationals?! It was overall a good experience. We met some very amusing characters! Including an Iraqi Jewish lady who seemed determined to talk us down and spouted all sorts of inaccurate and unsubstantiated statements. Recalling the Muslim etiquette of dealing with such people we patiently took what she said and tried to explain the facts to her though in vain. At which point 3 students took interest in the conversation - their intention it turned out was to advise and support our cause. Alhamdillah. Later in the day an amusing Egyptian approached us with the words 'this is a waste of time and money'! This was something we didn't understand but just shows how much work we have to do to get the message across to the Muslims especially. We plan to be at Edgware Road this Saturday too from 12-2pm. Alhamdillah we can say the first day was very successful and we all felt very motivated and encouraged. Just the day before we were apprehensive but it just shows you what you can do when you put your trust in God and do your duty. This weeks picket outside M+S in Bolton was attended by a grand total of 7 people. That figure includes 2 girls under 13, and an 82-year-old man. Needless to say the 82-year-old was the only male, non-Muslim who did attend. I figured the brothers must have been at home doing the washing up or shopping in the sales to counter gender inequality...!!! deserve what is happening to them. It just shows how much work needs to be done. Br. Karim, a Libyan in Coventry, I met brother Karim his wife & child out side M & S store in Cove city centre. I was giving him a leaflet on Boycott Israeli goods, when a council worker approached me and asked me to stop leafleting. I said to him "There is no law against giving some information to a friend is there"? The council worker said "He is not your friend you were just giving him a leaflet as a bypasser"
The brother had walked away a few steps by then, i said to the council worker with so much confidence " No you are wrong he is my freind, come with me and ask him, if you don't believe me"
I walked upto brother Karim with him and asked " Are you my friend or not" he was a bit confused at first he had never seen me before. I repeated my question " This man wants to know whether you are my friend or not". By then he got it and he said to me looking at the council worker "Of course you are my friend" The council worker was so superised and little amazed at his response, deep down he was so sure that we had never met before, but he appologised for not believing me. Br Karim advised me to take care in future and gave me his e-mail address to let him know if there is anything he can do to help.